or take his medication? So many questions stirred my emotions. Max needs daily prompts with applying deodorant, brushing his teeth and hair plus many other reminders throughout the day. I thought how is he ever going to make it, would he be a burden to the leaders and would he be able to keep up with the other scouts? Unsure how to deal with these uneasy feelings I put trust in the Lord that He would help me to push these negative questions out of my mind. To do it was the question I wondered about, to hike without a rehabilitation worker? I spent hours with Max packing and repacking his backpack. I packed with optimism he would remember. After each drill of packing his backpack I thought about other teenagers his age, including my two older sons when they were teenagers and how they never needed my help packing. I told myself to stop comparing Max to others. Sunday at church there were two scouts that spoke and shared the detail information of how the trip went. I focused on each word soaking in the detailed information that my son could not tell me. I asked Max what happened on the trip. 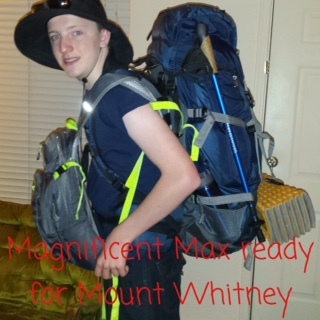 He responded with, “Mom, I’m ten times stronger than I was before Mount Whitney and now I’m ready to serve a mission.” I loved his response, but wanted to hear what the hike was like, or did he see anything that was extraordinary. Did he have a hard time or problems sleeping? I did find from empting out his backpack that he forgot to take his allergy medication. He forgot to change his socks and clothes. He didn’t eat all the meals I put individual plastic bags. When he called the morning he was traveling home he said, “Mom the only part of my body I have washed is my hands with wipes.” He asked me to put him on speaker phone so he could talk to Malachi and share his experience of the week. He said, “Malachi, I know what it was like for you in Russia. I know what it’s like to walk in Siberia because I hiked in cold weather fifty miles and my hands got numb.” His voice was filled with excitement and joy that he had experience what his brother had on his two year mission to Siberia, Russia. He doesn’t hear my prayers. Max is a happy go lucky young man, who lives with no guile or deceit. I look back on the toddler years and see how far he has come. There were times when he was young I never thought he would talk or be able to live the life he has lived. I never dreamed he would be the kind young man that he became. The aggressive behavior he had as a young boy has vanished from him. For those who struggle with a young child who lives daily with Autism hold on, because the journey becomes priceless as the years roll forward. All the hours of speech, occupational, and music therapy have paid off and are still paying off. Never doubt, never doubt what your child who lives with autism can achieve, because I know they can achieve more than you will ever dream of. The key to success is prayer and faith in our Heavenly Father. The father and son who helped Max told me a story about Max on the trip. Here is what they said, “Max was using the restroom and when he came out he couldn’t find his backpack. He looked and looked for it and finally we told him someone took it. Max said Oh darn. We then told him we had taken it across the river and it was waiting for him. He never got upset or angry. A quote from Max. "God made the mountains that I hiked on. The mountains are God's temple."